Clearance Of All Stock, Available While Quantities Last! The only base plates available are the 7" models as listed below. They have a 1 1/2" center opening. All sales are final, no returns. NOTE: This model does not have the corner holes pre-drilled for mortise bearings! 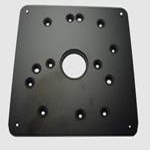 See our base plate guide and refer to Base Plate Type B for a complete listing of routers that mount to this base plate. 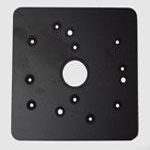 Centering Disk ensures exact centering when mounting a base plate. Fits our base plates with a 1 1/2" center opening. Safety Guide Pin (SGP010) required but not included with the centering disk. This centering disk does NOT have threads so therefore CAN NOT be used as an insert for router operations. 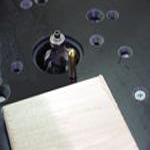 Step 1: Place the safety guide pin (SGP010 not included) into the collet of the router. Step 2: Place the centering disk into the 1 1/2" recess of the base plate. Step 3: Plunge the base down and lock into position so the pin protrudes thru the centering disk. Step 4: Secure the base plate to the router with the correct mounting holes and screws. 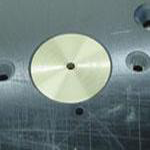 Safety Guide Pin fits into the pre-drilled hole in our 11" base plates with 1 1/2" center hole. The pin is included with all 11" base plates with 1 1/2" center hole. Required for centering when using the centering disk (sold separately). This solid brass fulcrum or safety guide pin fits into the predrilled hole on the base plate which is located between the bit and the operator. 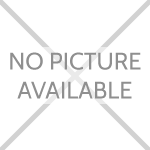 Used when a table fence cannot be used for irregular molding. Please Note: The router bit MUST have a pilot bearing. Set of 3 solid brass safety guide pins. Note: 1 safety guide pin comes with 11" base plates with 1 1/2" center hole.